The over-indulgences of the holidays are in evidence when you step on the scale, or when it's hard to zip your pants zipper all the way to the top...there wasn't a holiday season in recent memory when I didn't step onto the bathroom scale with extreme trepidation. Walk more - I love my FitBit, which lets me know how far I go every day - it inspires me to get up from the computer and walk around -- and when the weather is bad, I drive up to Northbrook Court and walk early in the morning. They open the doors around 6 am, and lots of people are in there walking in pairs or packs or on their own. Check with your local indoor malls - perhaps others do this as well. Drink more water - it really helps lower your weight. I know several people who developed kidney stones in the past couple of months, and dehydration is a big contributing factor. Water helps your health in many ways! Don't buy the bottled stuff, use a reusable bottle from REI or LL Bean etc. and drink filtered water from the fridge or get one of those filters for the sink. Bottled water is like $8 - $15 per gallon - and you have to dispose of the bottle, preferably in a recycling bin. Get rid of the remaining holiday chocolates and cookies when you've just eaten - toss 'em in the garbage when you're feeling full and are less tempted to eat them away. shed the extra weight. 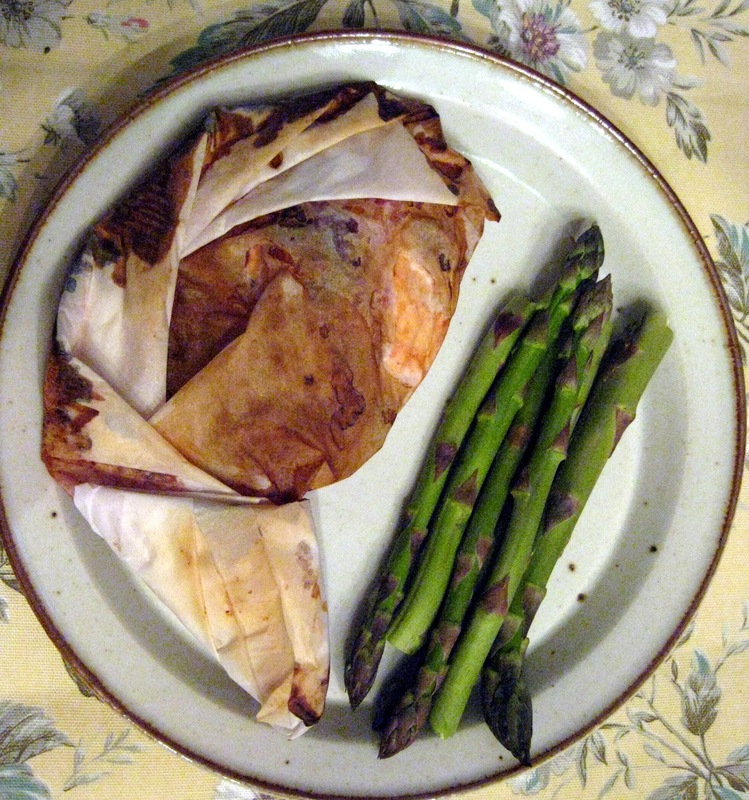 I love Burhop's fresh papillotes, salmon wrapped in parchment paper with a variety of fresh vegetables. Only a tiny amount of olive oil is added, and the fish steams in the package, a very healthful way to prepare both the fish and the vegetables, which enhances and blends all the flavors. Fish is a wonder food - it offers a host of trace minerals and important vitamins, the vital omega-3 fatty acids, and prepared properly it's great diet food. Breaded fried fish, not so much, but baked, broiled or grilled fish is great for losing weight. My favorite preparations are simple - I bake my fish at 425 degrees for 10 minutes per inch of thickness - the Canadian cooking method. Good, fresh fish can be rubbed with a little olive oil and a squeeze of lemon, or if you like it a bit spicier, try a salt-free spice rub. (Salt makes you retain water - not good for losing weight). Some low cal toppings that we offer and recommend with your fish include Pico de Gallo or Bruschetta, and our Lemon Dill Sauce - depending on where you are, any good fresh tomato or fruit-based salsa makes a good low or no fat topping for fish. Whatever you do, start with REALLY FRESH FISH. Good quality fresh seafood will give you a much better chance at making a really good dinner. If the fish isn't fresh to start with, no cooking preparation is going to make it palatable. Fill up on vegetables and a nice piece of fish, drink lots of water, and walk. How hard is that? Why don't fish have mercury issues? Why do so many people only eat wild caught fish?